Reprinted with the kind permission of The Antiquer, Vol. 2, Issue 9, August 2003. By the time Victoria acceded to the throne in 1837, industrialization was shaping the course of Britain’s future. The new queen’s youthful charm restored the flagging spirits of the nation and polished a crown that was tarnished by the foreignness, ineptitude, and general unattractiveness of preceding Hanoverians. During a reign of over sixty years, Victoria led her nation into global acquisition and a well-defined industrial age. However, The Age of Industry was a period of blessings and curses. Great masses of people became veritable slaves to the machines of industry, war, and popular culture. Technology defaced landscapes with factories, but it also generated employment opportunities. Rural dwellers left their farms and relocated to larger cities where they found work but became as displaced as the mythos of their former lives. The gaps between classes widened: the rich became richer, the middle class rose, a working class infrastructure supported the economy, and the poor sank deeper into abject poverty. Throughout the sceptered isle, the most wretched privation sat cheek-by-jowl with displays of prosperity and ostentation, and the conspicuous separations among classes was a principal cause of spiritual disquiet. The Victorian Era was a time of contrasts, and the Gothic idiom was a perfect fit in its concern with the contrast between spiritual beauty and the worldly grotesque. Gothic was known in medieval times as the French Style – an architectural rather than interior style that dominated the Middle Ages from the twelfth century until the fifteenth century Renaissance. As much as Gothic was a style, it was more precisely an architectural philosophy. Interestingly, the term Gothic was not used during the 400-year period that the style prevailed. It was coined when Italian Renaissance writers wrongly attributed what they considered the unsightliness of medieval architecture to fifth century barbarian Goths responsible for the downfall of Classical culture. “Gothic” was a pejorative and remained so until the style was reassessed during the nineteenth century. The early British Gothic Revival is identified with William Beckford (1760-1844) whose Wiltshire country house (called “Fonthill”) was designed (1796-1807) in the Gothic style by James Wyatt. An enormous building, Fonthill was badly constructed and, after its 278-foot tower collapsed in 1827, the rest of the structure was razed. Most sources credit the beginning of the Gothic Revival in England to Sir Horace Walpole who, after publication of his Gothic-inspired novel The Castle of Otranto in 1765, remodeled his country home (“Strawberry Hill” near Twickenham) in the “Gothick” manner. Strawberry Hill became a model for Gothic Revival architecture that evolved in reaction to the rigid symmetry and balance of Classical Georgian and Regency buildings. However, it was Augustus Welby Northmore Pugin (1812-52) who brought the Revival to fame. Pugin excelled in the invention of Gothic-inspired forms and, through his efforts, the Gothic Revival remained true to its historical source. John Ruskin (1819-1900), a writer, critic, artist, and philosopher, was greatly influenced by Pugin. After returning from France and Italy where he sketched medieval architecture and sculpture, Ruskin wrote The Seven Lamps of Architecture (1849), which dealt with Gothic architecture and its spiritual connections. Pugin and Ruskin believed that the Middle Ages provided a defining moment in human attainment and that Gothic architecture exemplified the perfect entwining of artistic and spiritual values. Under their leadership, the Gothic philosophy became deeply embedded in Victorian sensibility. Based on profound moral and philosophical ideas, it was the most significant of numerous nineteenth century returns and revivals. Typical Gothic architecture is distinguished by two principal features: elevation and light. Inspired by the religious intensity, scholasticism, and mysticism of the Middle Ages, Gothic design suggests human aspirations toward God. It is best defined by spiky linearity, fanciful stonework, barrel vaulted ceilings held in place by outside supports, dramatic heights punctuated by lofty spires, masonry vaults, and walls that give the appearance of tall columns set between windows in which stained glass maximizes the effect of transforming sunlight into multi-colored patterns on interior surfaces. Floor plans are usually cross-shaped, recalling the death and resurrection of Christ, with the horizontal arm of the cross (the transept) extending from the main body (or nave) of the building. Norman Gothic architecture (1066-1200) was comprised of transitional buildings, some retaining the piers and rounded window openings of the earlier Romanesque style. Less ornate vaulting and decoration gave little indication of the elaborate stonework that would follow. Examples in England include Wells and Durham Cathedrals. Early English Gothic architecture (1200-1275), known as the “Lancet” period, is typified by pointed or lancet windows that were narrow and without the ornamental intersecting work called tracery. The form was comparably austere with uncomplicated barrel vaulting and simple proportions. The finest example of this period is Salisbury Cathedral. English Decorated Gothic architecture (1275-1375), also called “Flamboyant,” is linked to the French Rayonnant style (1200-1280). These analogous periods were characterized by increasingly elaborate geometrical decoration on structural forms, intricate tracery, use of ogee or S-curves, and decoration with lobe or plant-shaped curves called “foils” that were formed by the cusping of circles or arches (trefoils, quatrefoils, cinquefoils, and multi-foils). By this period, the rose window (a circular stained glass window with radiating tracery in the form of a rose) had been introduced and windows in general had become wider than lancet openings, resulting in less wall space. This design concept was facilitated by use of flying buttresses (masonry supports with the appearance of long arms that consisted of piers or buttresses outside the main structure and connected to it by arches). Exeter Cathedral is a prime example from this period. The apex of Gothic in Britain took place during the “Perpendicular” period (1375-1530+). The essential characteristic was, as the name implies, strong vertical lines in both wall paneling and window tracery. Vaulting took on intricate fan shapes, and flowing decorative features were added to flying buttresses. Towers were pinnacled and ornately decorated; windows were enormous traceried webs of stonework. Examples include Henry VII’s Chapel at Westminster Abbey and King’s College Chapel at Cambridge. Gothic sculpture was closely linked to Gothic architecture and included statues of the Holy Family and saints that stood in the portals of cathedrals and other church buildings. Gothic painting followed the same course as architecture. As the scale of structures grew, so did the scale of paintings. By the fourteenth century, artworks were used as decoration in the ornamental screens behind altars (called retables) and usually featured New Testament themes. Emphasis was placed on flowing lines and intricate detail, and gold was often applied as a background color. As Gothicism advanced, paintings, like architecture, became more complex, and secular subjects (hunting scenes, chivalric motifs, and illustrations of historical events) began to appear. Manuscript illuminations were a major component of Gothic art. By the Late Gothic period, focus had drifted from church buildings to secular edifices, and Flamboyant elements were widely used in the design and construction of guildhalls, town halls, and homes. Gothic was phased out as the Renaissance took hold, and Classical architecture held sway until the late eighteenth century when “Gothick,” Rococo, and Chinoiserie elements were expressed in romantic, frivolous interpretations that lacked historical accuracy. At the outset, the Gothic Revival was an architectural phase of the Romantic Movement, which idealized the past and underscored emotion, spontaneity, and individuality. Eighteenth century Romanticism gave rise to steeply pitched gabled roofs, gingerbread trim, wall dormers, polygonal chimney pots, and hoodmolds over windows. In English literature, the novels of Sir Walter Scott and poems like Coleridge’s “Christable” and Keat’s “The Eve of St. Agnes” emphasized medieval themes and imagery. In the nineteenth century, advancements in printing techniques brought reading materials to a larger public than ever before and, although illiteracy was still widespread among the poor, members of the upper and middle classes prided themselves on being well-read. Literature, both fiction and nonfiction, was, in large measure, responsible for advancing the Gothic Revival. Pugin’s Contrasts (1836) theorized that the superiority of medieval life and art should be emulated in the nineteenth century. In The True Principles of Pointed or Christian Architecture (1841), he suggested that nineteenth century architects use medieval methods to achieve the high standards of craftsmanship and the structural lucidity of the Middle Ages. John Ruskin promoted these concepts in his book The Stones of Venice (1851). Followers of Pugin and Ruskin found themselves involved in conflict with Classical revivalists, but the Church of England supported the Gothic Revival when it made provisions for the restoration of medieval religious buildings. One of the most important influences on the Gothic Revival in church design came from the ecclesiological movement initiated by the Cambridge Camden Society (after 1846 known as the Ecclesiological Society). In 1841 the Society pioneered publication of “The Ecclesiologist,” a periodical in which members advocated the architectural principles of the Decorated Gothic period. In Victorian Britain, academic issues and fundamentalist religious movements led to increasing interest in the cleanness of Gothic philosophy. Under the influence of Pugin and Ruskin, Victorians of the 1830s and 40s approached Gothic style with greater historical precision than was seen in the Gothic whisperings that began in the eighteenth century. Urged on by Pugin and Ruskin, encouraged by The Ecclesiological Society, boosted by popular sentiment, and enlivened by “Gothic horror novels,” the Revival gathered momentum. In the fast-paced and rapidly changing Victorian world, Gothic devices captured the communal imagination and spoke to an underlying spiritual need. The period from 1855-1885 is known as “High Victorian Gothic” during which an enormous range of Gothic-style buildings (from hotels to railway stations to private houses) and structures like the Albert Memorial were constructed. Most Gothic Revival houses were built between 1840 and 1870: features included steeply pitched roofs, side gables and cross gables, board and batten siding, and one-story porches with arched trim. The transition from Gothic architecture to furniture brought interpretations of Gothic style to Victorian Era chests, bookcases, sideboards, dining tables, dressing tables, beds, sofas, and chairs. Early Revival furniture followed the designs of George Smith (1786-1828), who relied heavily on ornament for period effect. 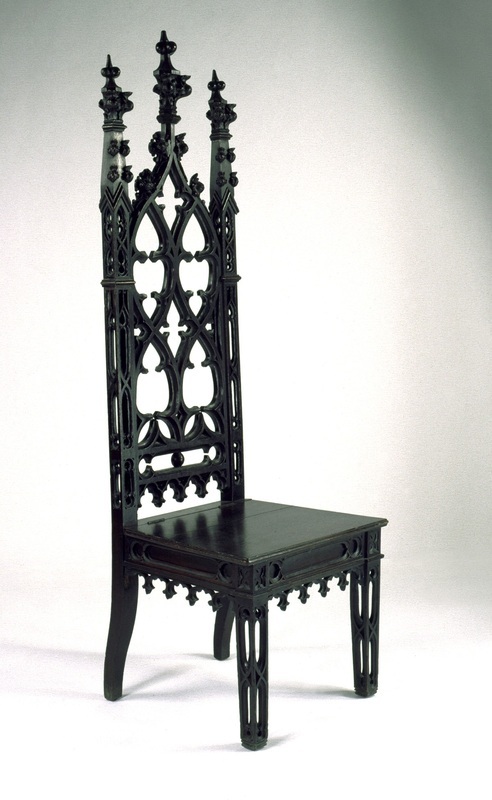 But Pugin’s 1835 book, Gothic Furniture in the Style of the Fifteenth Century, encouraged greater purity of structure and form, and designers responded with lancet-shaped mirrors, frieze rails with carved arcading, and table bases with solid ends pierced by stretchers. Chairs featured crocketed finials and lancet, linen fold, and ogee paneling. In most furniture of the Revival, oak was the wood of choice. The popularity of longcase clocks waned during the early nineteenth century, but bracket clocks remained in style. Fashionable from the 1830s-50s, Gothic Revival clocks took the same basic form as Regency clocks; however, their dial plates were made with pointed arches, fretted side panels mimicked Gothic tracery, and cluster columns (copied from Medieval architecture) ornamented clock case corners. Stained glass craftsmanship, intrinsic to Gothic cathedrals, declined well before the eighteenth century but was revitalized during the Victorian Gothic Revival. Antiquarian Charles Winston worked with Pugin to reestablish the standards of medieval stained glass, and Winston’s experiments during the 1850s resulted in quality that was very close to that of the Middle Ages glaziers. William Morris & Co., in particular, produced exquisite stained glass in the medieval manner. In literature, Gothic novels like Ann Radcliff’s The Mysteries of Udolpho (1794) and Mary Shelley’s Frankenstein (1818) were precursors of the Victorian Gothic novel, and characters like Lord Byron’s darkly brooding heroes contributed to the Victorians’ fascination with the Gothic “persona.” The Gothic mood was underscored in the Brontë sisters’ Jane Eyre (1847), Wuthering Heights (1847), and The Tenant of Wakefield Hall (1848). Victorian interest in science and the supernatural was articulated in Gothic horror genre stories like Le Fanu’s vampire tale Carmilla (1872) and in novels like Stevenson’s The Strange Case of Dr. Jekyll and Mr. Hyde (1886) and Stoker’s Dracula (1897). Gothic drama was not restricted to printed materials, and novels like Jekyll and Hyde were adapted to the stage where spectacularly sinister characters leapt from the pages of books to entertain Victorian theatergoers. Academic painting also looked to historical antecedents for its subject matter. Of particular note and linked to the Gothic Revival was the Pre-Raphaelite Brotherhood (1848-1853). The Pre-Raphaelites rejected the cleverness of High Renaissance art, Victorian industrialization, capitalism, and materialism, and were inspired by Ruskin’s “Truth to Nature” credo. They developed their values from Gothic “thought” to revive the aesthetic simplicity and moral honesty of European art before the time of Raphael. Members of the founding group included Dante Gabriel Rossetti, John Everett Millais, and Holman Hunt. Denouncing the sterility and formula-driven art of the Royal Academy, the Brotherhood attracted disciples like Edward Coley Burne-Jones and William Morris. Although the original Brotherhood was short-lived, its members pioneered greater individuality in British painting, and their influence was felt into the early twentieth century. While Victorian taste is remembered as a sometimes capricious mix of Renaissance, Rococo, Neo-Classical, and Romantic elements touched by stylistic disorder and ornamental extremes, its relationship with Gothic art was more than a mere flirtation. Once the revival took hold, Gothic-style trefoils, quatrefoils, cinquefoils, lancet shapes, arch forms, and ogee curves were incorporated into nearly all the fine and decorative arts and were added to the lexicon of fashionable design. Jewelry drew inspiration from medieval styles. Silver tea sets adopted Gothic devices crafted in high relief. Ironwork highlighted Gothic details in fencing, gates, garden furniture, and ornamental door fittings. Textiles incorporated Gothic elements, and medieval-style tapestries were hung in Revival-era homes. Even the celebrated Staffordshire potters featured Gothic patterns in their transfer printed tablewares, and figures of medieval personalities like Robin Hood and King John (signing the Magna Carta) appeared in the potters’ repertoire of earthenware portraits. The psychology of England’s “new world” caused her people to look to its medieval inheritance for redemption over bleak and soulless industrialization. In the architectural splendor and religious strength of the Middle Ages, the Victorians recognized a time that praised God with human achievement, and they rewrote “Gothic,” the Renaissance term of derision, into a cultural metaphor that expressed their temporal aspirations and spiritual needs. In Britain, Gothicism flourished longer than any other nineteenth century revival. It set the foundations for the idealized tenets of the Aesthetic Movement and the back-to-basics canon of Arts and Crafts.